To identify a bird, we recommend that you use the Cornell Lab of Ornithology "All About Birds" Bird Guide. 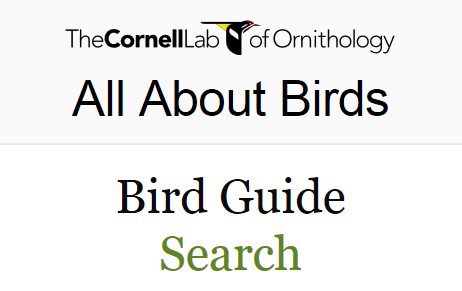 Click on the image below to open a new browser window with the Cornell Lab bird identification site where you can search by common name, species name, taxonomy or shape. Start with the shape search if you are uncertain what type of bird you are looking for.